Type: V-Neck Jumper Sweater. Material: Cotton. Label Size: Size 8 Small. Colour: Green. Condition: Good Used Condition - the item shows minor signs of previous wear. Type: V-Neck Jumper Sweater. Label Size: Size 18 XL. Material: Cotton. Colour: Red. 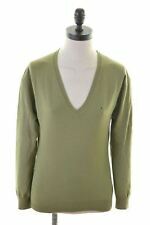 Tommy Hilfiger angora blend jumper in Turquoise size Small. 50% angora and 50% nylon - super soft and warm. Type: V-Neck Jumper Sweater. Material: Cotton. Colour: Brown. Tommy Hilfiger cable knit sweater. Cotton, nylon, spandex mix. Overall condition is okay, minor signs of use. Long sleeved. Type: Crew Neck Jumper Sweater. Material: Wool. Condition: Good Used Condition - the item shows minor signs of previous wear - Small hole on the back, light bobbling material all over. Label Size: Size 10 Small. Style sweater zipper. Sleeve: 26". Sleeve Length Long Sleeve. Material 100% Cotton. Size Type Regular. shoulders: 17". Armpit to armpit: 21". Length back part: 24". KNITTED CARDIGAN. NAVY BLUE & RED. DIAMOND FAIRILSE PATTERN. WITH BUTTON DOWN FRONT FASTENING. PIT TO PIT: 18"/45.7cm's. Size & Fit. PIT TO CUFF: 14"/35.5cm's. COLLAR TO HEM: 24 "/60.9cm's. SHOULDER TO HEM - 24.5". 100% Authentic Tommy Hilfiger. Tommy Hilfiger. The item for sale is pictured above and described on this page. Material: 100% Cotton. Color: White. Material 100% Cotton. Color White. UPC: 190607764112. Short sleeves beige jumper by HILFIGER DENIM. 54% nylon, 42% angora rabbit, 4% lambswool. Hand wash only. Length: 56cm approx. 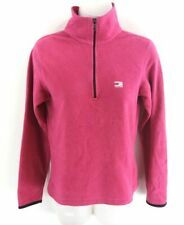 Tommy Hilfiger 1/4 zip sweater. Tommy Hilfiger womans blue check shirt size medium . Condition is Pre-Owned. Sent with Australia Post Pre-Paid Parcel Post Satchel 500g. Type: Cardigan Sweater. Material: Cotton. Colour: Brown. Label Size: Size 10 Small. Condition: Good Used Condition - the item shows minor signs of previous wear. Colour canvas neutral pink & baby blue. Length from top of shoulder to hemline 23". Argyle, diamond pattern. V neck line. 100% pima cotton. Long sleeved. It has long sleeves and a crew neckline, and a white horizontal stripe pattern throughout. It features a three-button closure at he side of the hem. This casual top would be ideal for many different informal social occasions. Type: V-Neck Jumper Sweater. Colour: Multi. Material: Cotton. Label Size: Size 10 Small. Condition: Good Used Condition - the item shows minor signs of previous wear - Light wearing marks under the armpits. 55% cotton, 23% acrylic, 22% nylon jersey. In good used condition except slight fabric pilling and white stains on the inside (see the picture gallery). 7-button placket. Long sleeve. The order may arrive in 4 weeks for rare situations. Type: Crew Neck Jumper Sweater. Material: Cotton. Label Size: Size 10 Small. Condition: Good Used Condition - the item shows minor signs of previous wear. Colour: Red. Type: V-Neck Jumper Sweater. Colour: Pink. Label Size: Size 16 Large. Material: Cotton. Type: V-Neck Jumper Sweater. Fit: Loose Fit. Condition: Good Used Condition - the item shows minor signs of previous wear - Light bobbling material under the armpits. Colour: Navy Blue. Material: 100% Linen. Condition: Very Good Condition. Type: Cardigan Jumper. Colour: Grey. Material: Cotton. Type: V-Neck Jumper Sweater. Label Size: Size 16 Large. Type: V-Neck Jumper Sweater. Colour: Turquoise. Label Size: Size 18 XL. Material: Cotton. Type: Crew Neck Jumper Sweater. Style: Italian Yarn. Label Size: Size 10 Small. Condition: Good Used Condition - the item shows minor signs of previous wear - Light bobbling material. 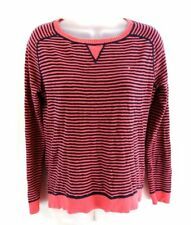 Bright pink 100% Pima Cotton cable knit jumper size XL. 100% Pima Cotton. by TOMMY HILFIGER. Fine cable knit. W This is a Stunning. Over the head - No fastenings. Type: V-Neck Jumper Sweater. Material: Cotton. Colour: Red. Type: V-Neck Jumper Sweater. Label Size: Size 20 2XL. Colour: Orange. Material: Cotton. Type: Roll Neck Jumper Sweater. Colour: Pink. Material: Cotton. Label Size: Size 10 Small. Lovely lightweight fine knit jumper. Jumper wasnt much worn and in great used condition with no defects. Sz S / 36 UK 10. Loosed knit diamond shapes pattern. Type: Crew Neck Jumper Sweater. Material: Cotton. Colour: Brown. Label Size: Size 10 Small.